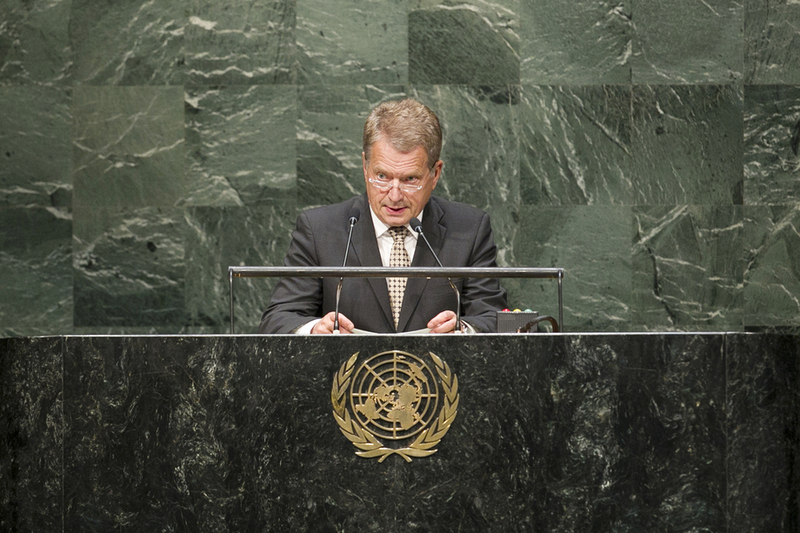 Sauli Niinistö, President of Finland, said that recent crises in the world had violated “the core values and rules upon which the United Nations is based”. The situation in Ukraine had a deep impact on Europe’s security, but the matter should be of concern to the entire world, as upholding the rule-based global system was a precondition for peace and security, human rights and development. “If we cease to protect this system, it will cease to protect us,” he warned. He asserted that the Security Council had not upheld its responsibilities in Ukraine or Syria. With that, he called for its reform of veto use. At the same time, he praised the General Assembly for adopting an earlier resolution on Ukraine’s territorial integrity. Still, more could have been done by that body to condemn the actions of the Russian Federation, which must take “active steps” to stabilize the situation in eastern Ukraine. On Syria, he urged the world not to abandon the conflict-ridden State, which had witnessed half its population perish or flee to neighbouring countries. The international community must tackle that challenge together and show the same resolve it had shown after the chemical attacks months ago. He called on the Council to refer Syria to the International Criminal Court, a mechanism that “must be used when the national justice system is not able to deliver”. With so many conflicts unfolding, international cooperation was needed more than ever, he said. The world shared important challenges, such as climate change, and with the post-2015 agenda nearing, it must aspire to a new kind of global commitment that met the needs of planet Earth; “all resources and means should be mobilized” to meet those pledges. While public funding for sustainable development was important, particularly in areas affected by conflict, innovation, trade, technology and investments must play a stronger role.